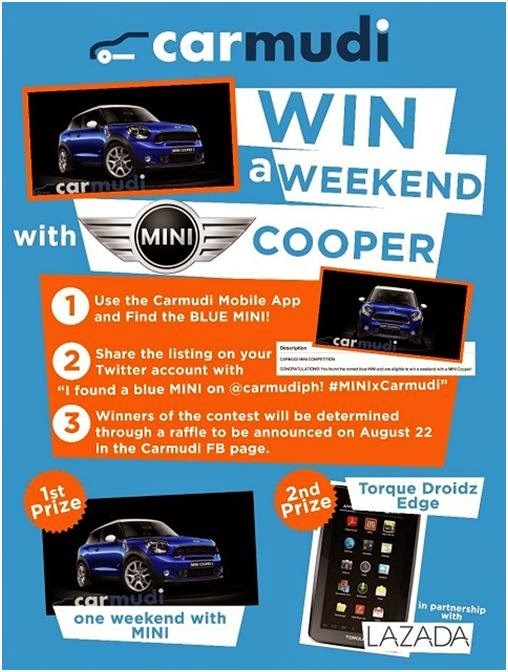 The largest online car buy and sell platform, Carmudi Philippines, is giving Filipino car enthusiasts a chance to ride a Mini Cooper for a weekend by spotting the winning car product on the www.carmudi.com.ph website. The second prize winner gets a 7" Torque Droidz Edge android phone from Lazada. The contest winner, which will be determined through a raffle, is free to drive around the Mini Cooper anywhere during the given period. 1. To join the “Find the Mini Cooper” Contest, log-in to the Carmudi PH website and look for a blue-colored Mini Cooper with a description that says “Congratulations”. Share it on Twitter with the words “I found the blue MINI! @carmudiPH #MINIxCarmudi” together with its attached picture. Multiple tweets are allowed. 2. For Android users, you can use the Carmudi App by downloading it from the Google Play store. For Apple iOS users don’t fret. You can use the regular site to join the contest. 3. The Promo runs until August 22, 2014, at exactly 6 p.m. Only the people who have completed the instructions above are qualified for the raffle phase. Carmudi Philippines will list all the tweets related to the contest, starting from the earliest to the latest, before beginning the lottery. 4. During the raffle, all tweet entries will then be counted and sorted. Each entry will be given a number according to the time they were posted on the internet. A Carmudi representative will then pick a raffle number that will correspond to the winning tweet. 5. Winners will be contacted directly after the lottery results are confirmed. Claiming of the Prizes: 1. Winners can claim his/ her Gift Certificate from MINI or the 7" Torque Droidz Edge android phone from Carmudi's office: 9th Floor Rufino Tower Building, 6784 Ayala Avenue corner V.A. Rufino St., Makati City. 2. The GC is valid until December 31, 2014. The winner should inform MINI Global City not later than 3 days prior to the preferred weekend drive to check the availability of the unit. Unit must be picked up Friday afternoon and must be returned by Sunday Evening. 3. Kindly call MINI Global City office (02) 856-7555 local 4134 and look for Mae Valdez, Debbie Fuertes, or Via Sanchez to reserve the unit.